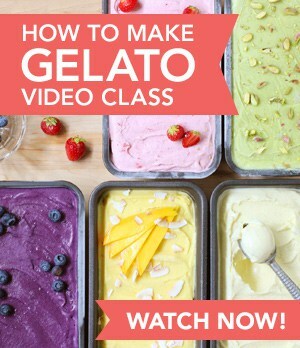 Italian food is my favorite to cook at home, I own countless cookbooks on the subject, I love to go out and eat at Italian restaurants and it’s my fourth trip to Italy – but still, I’m learning. Nothing compares with being immersed in the Italian culture whenever you get the chance to travel there. Your knowledge increases tenfold in just a few days. Ask questions, eat where Italians do, mingle with locals and you’ll come back home with hundreds of ingredients to taste and recipes to cook. Here are 10 new things I learned about Italian cooking and food culture over my latest trip to Rome. 1. Cappuccinos are a no-no after breakfast. You probably heard of that one. It’s every guidebook’s golden rule. I knew this but never talked to native Italians about it. It’s their pet peeve, they really can’t stand the idea of a cappuccino during the day, especially after dinner. It may be like ordering a glass of red wine with your oatmeal in the morning. Many North-Americans are addicted to their milk-based coffees, but when traveling, why not try something different? You’ll get bonus points for blending in with the locals. 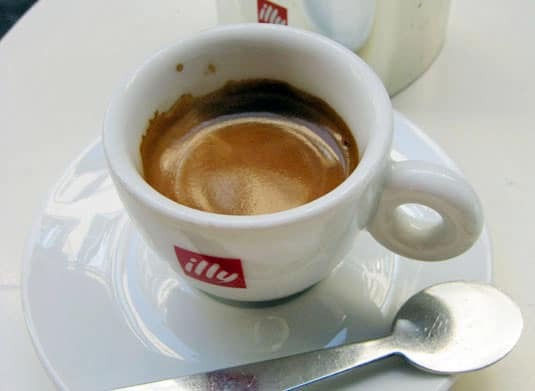 A cup of rich and strong Italian espresso. 2. No parmesan cheese with seafood pasta or risotto. I love Parmigiano-Reggiano and I could sprinkle it on anything. I guiltily learned in Rome that you shouldn’t have it on anything involving seafood. I know I’ve used it in shrimp risottos! Asking parmesan to go with your Vongole pasta is as bad as ordering a cappuccino at 10PM. Just don’t do it. Since learning this “rule”, I’ve had two risottos without any cheese in it and thought it made a lot of sense: the dish is naturally creamy because of the rice and stirring method, and the delicate taste of seafood comes through much better. 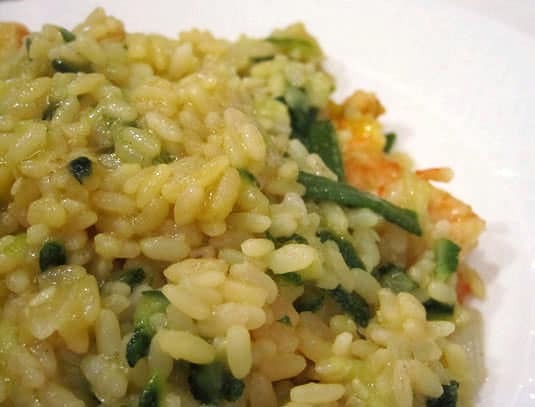 My first risotto without cheese at Ripa 12, in Trastevere (shrimp and zucchini risotto). 3. Dipping bread in olive oil is not an Italian thing. To keep on with the “what you shouldn’t eat in Italy” theme, I was very surprised to learn that olive oil bread dipping is not an Italian thing at all. Eleonora went so far as to tell me that the idea of replacing butter with olive oil was totally Anglo-Saxon. Many restaurants will offer bread and olive oil before your food arrives, but it’s because they know you want it. 4. Authentic Carbonara sauce has no cream in it. Being lactose intolerant, I always considered anything Carbonara was out of my league because it’s so often made with cream back home. Perhaps my most enlightening discovery was to find out that authentic Carbonara sauce is made only with eggs, pecorino romano, fried pancetta (or better, guanciale), black pepper and a little cooking water from the pasta. The result is the most luscious concoction I’ve ever had. 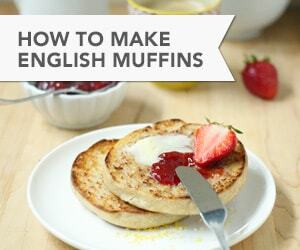 Mind you, even without cream, it’s still very rich and it’ll be difficult not to indulge frequently back home. 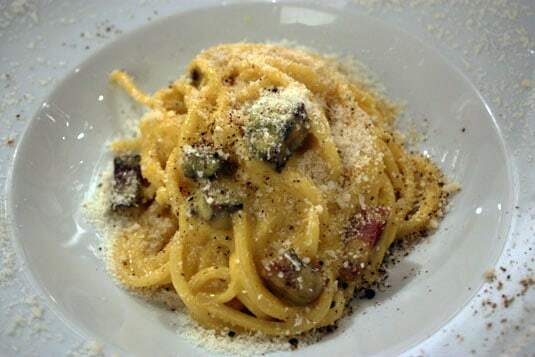 The best Carbonara I had in Rome, at Roscioli. 5. Italian school lunches are all-organic. With the fierce battle to improve school lunches going on in America, I almost fell off of my chair when I learned that Italian kids attending public schools eat 100 % organic and local lunches. Parents even get a detailed menu of what their kids are going to eat over a given week to make sure they won’t eat the same thing for dinner. How great is this? This article details the initiative and quotes that “parents who send their kids to public schools pay more attention to what their children eat rather than what they read.” While both topics should hold equal importance, I say that showing such care about one’s health from the youngest age is refreshing. 6. 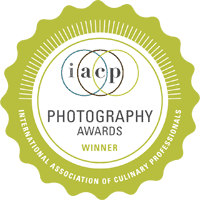 Italians have been locavores for centuries. 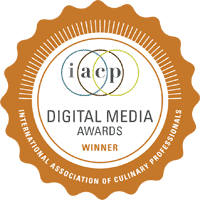 “Locavore” is probably one of the most trendy foodie terms right now. When I mentioned it in Rome, eyebrows raised. 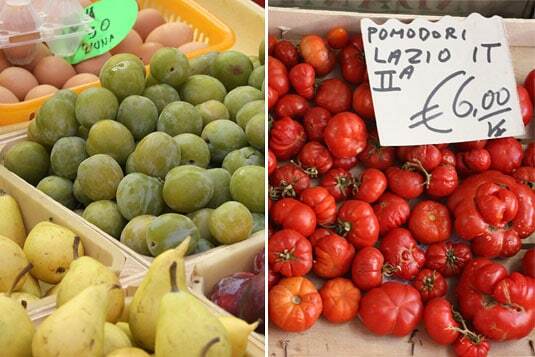 Italians don’t need a trend to eat locally – it’s simply the way it’s been for centuries. Italian food is a simple cuisine based on the freshest ingredients available. You go to the market and see what’s available – then you build your menu. When I visited Rome, it was zucchini, artichokes, porcini and radicchio season. These vegetables were heavily featured in menus, on which any dish based on frozen ingredients is clearly marked. Once you know something’s not fresh, it’s difficult not to make another choice. Fresh eggs, prunes, pears and tomatoes at the market. 7. The market tradition is very much alive in Italy. 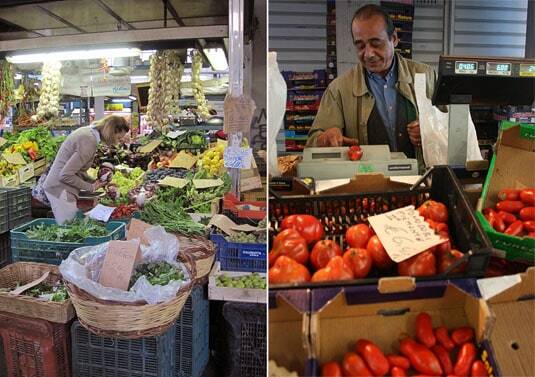 There are fewer supermarkets scattered around Rome compared to many other big cities, the reason being that many Romans still go to the market and specialized shops to select their ingredients from the merchants they’ve come to trust over the years. Big markets are open daily until 1 PM and they sell everything from fresh fish to toothpaste and clothing. Although the easily accessible one-stop-shop supermarkets are gaining in popularity, politicians, cooks, foodies and artisans are all fighting to keep the market tradition alive. At the Testaccio market: A woman carefully selecting her vegetables and a merchant known as the “Tomato Philosopher” for his vast knowledge about tomatoes. 8. Italians don’t have a big appetite for dessert. Having little room left for dessert is perhaps not so surprising when a typical meal consists of an antipasto (appetizer), a primi piatti (soup, risotto or pasta dish), a secondi piatti (meat or fish course) and a contorni (vegetable-based side dish). Of course, Italian won’t gobble all four courses on a daily basis, but still usually choose at least two to compose a meal. Dessert is usually something simple like fruits. Cakes, mousses and crèmes brûlées are for tourists who long for sugar at the end of a meal. Pastries and sweets seen in pasticcerias are most often eaten as a snack in the afternoon or as a special occasion dessert. 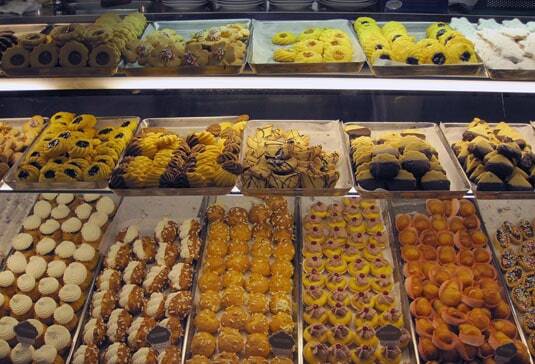 At selection of sweets at the Pasticceria D’Angelo, in Rome’s Trident neighborhood. 9. Italians like their pasta al dente. I mean, almost undercooked. … by North-American standards. Even the worst restaurant in Italy serves its (fresh or dry) pasta tender but with a good bite on the inside. I’m too often disappointed by the mushy texture of pasta served by many restaurants in North-America. A generous plate of perfectly cooked pasta will cost you under 10 euros in Italy. Budget is not a valid reason eat mushy pasta. I learned that some Italian pasta companies have started to increase their cooking times indicated on boxes sold in America to please our palates. 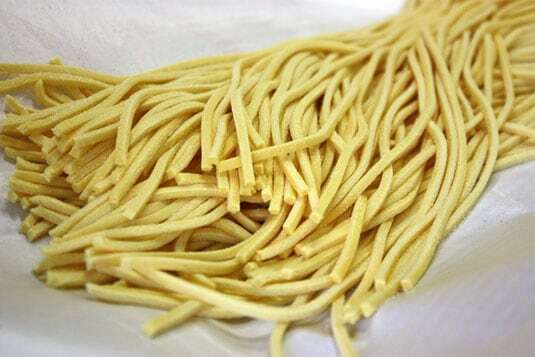 Reducing the instructed timing by one minute will usually get you pasta as Italians would eat it. Freshly made linguine pasta at Mea, in Rome’s Testaccio neighborhood. 10. There is an Italian paradox. Just like the much publicized French paradox, there is a similar contradiction between the Roman diet and their silhouettes. They drench their food in olive oil, drink plenty of wine, eat rich cheeses and – most surprisingly – they love fried foods. Fried artichokes, eggplant, cheese, rice, seafood; Roman antipasti were often heavy on the stomach. Still they manage to keep a healthy figure. Maybe it has to do with the quality of ingredients they use (even if they’re fried), the fact that they eat very little processed foods, or some other mysterious reasons we haven’t figured out yet. We really need to dig deeper into this. 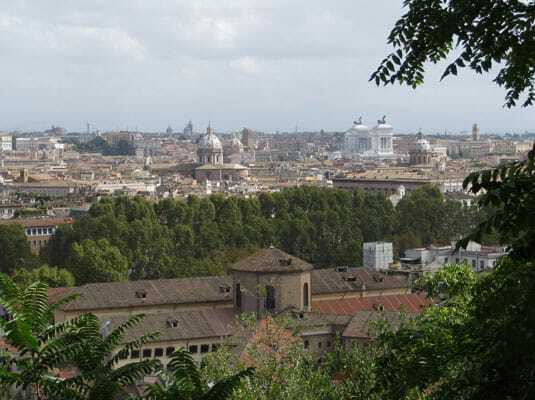 Rome, viewed from the Janiculum hill, in Trastevere. I see the blog was written quite a while ago, but it’s a must that I ask my question. Okay, so is it safe to say you should never ask for cheese regardless of the type when eating at an authentic Italian resturant?? I had asked for Romano cheese for my pasta dish at this Italian resturant when my family and I vacationed in San Diego, and the chef had came out. I honestly think it was because we order so much food, but my mother insisted it was because I had asked for cheese. I never seen him, but my mother saw him, and that’s when she told me that you’re never suppose to ask for cheese unless they offer it to you. In other words, my mother told me I pretty much offended his cooking. :( Thanks in advance! P.S. I love Italian food! There are a number of reasons why Italians don’t get too fat on average. 1. smaller portions. We get two or more entries but they are small. 2. much less dressing. You don’t get your pasta or rice drowned in sauce and covered with cheese. 3. no sweet drinks and no food out of lunch and dinner. 4. more fresh food and vegetables. I just spent a week and a half in Italy going from Rome to Napoli to Florence to Sienna to Venice and ultimately to Milan. I agree with you their plasta was quite different in taste compared to what I was use to in America. Actually I was not impressed at all by their pasta. Their Pizza was also different compared to ours in America. I did however fell in love with their Risotto. I found this nice restaurant in Florence that served an awesome seafood risotto. It was so awesome that I made sure that I ordered a second order before I left Florence (Firenze). Now coming back to America, I cant find a good Italian restaurant that serves a good risotto. I've looked at Olive Garden, Jonny Carino's and Maggianos for a good risotto dish but to no availe. Do you know a good restuarant that serves a good risotto dish in America? Especially in Texas? 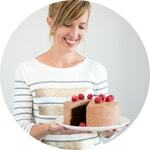 I just found your blog–so happy I did. We have the same sensibilities about cooking, especially Italian food. This post about Italy's food culture is so spot on. I love Italy and have traveled there often and I've also walked away with the same notes. So true, each and every one! I just read your bolognese post, too. Very nice. It took me a while to get my recipe right but now I'm so happy with it. And yes, it does contain the items in your list except for the pancetta (nothing against it at all)–I just use dried porcini mushrooms instead. I never found the cappuccino rule to be true, at least not in Lucca and Barga…the shopkeepers we made friends with while we were living there would always make us a cappuccino before siesta, and pour us a glass of wine before everyone went back to work! I think that Italians working in restaurants or in the tourism industry have become used to cappuccinos being served at any time of day. Of course, they won't pull you a face if you order and pay for it… But I was surprised to talk to some Romans, who were perhaps more attached to the Italian tradition, and see how closely they related cappuccino to breakfast. Italy has such good coffee, it's a great place to learn to drink it black or even very short as an espresso if you feel like it. As a side note, how beautiful is Lucca! Still my favorite Italian town, I wish I could live there for a while. I'm so happy much of what we discussed, tasted and laughed over went into this lovely post. And thank you for linking to my site! Hugs and fond memories from Roma. I didn't know about the olive oil thing. That's kind of surprising. Interesting! I love learning about food cultures. Does this relate to strictly food habits in Rome or all over Italy? In places like France what is a delicacy in Paris may be a heresy in Arles. Other places in Italy are quite big on lentils and legumes in their diet as opposed to pasta which is high in carbs. 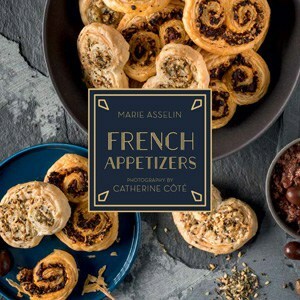 After experiencing several European food cultures first hand, French for example, there really isn't much of a paradox. The high fat and sugar foods outsiders perceive as staples are often only special occaision treats. You can't eat bacalhau con natas every day and stay slim! There are also life style differences and climate may also play a part. In a hot place you don't crave those sorts of comfort foods. I have also found that med cultures stress fruit and veg and olive oil and rarely go for processed foods. I think there is only on golden arches in all of the Algarve! Do you have any dos and don'ts for Thai food? I plan on visiting there and would like to avoid embarassment at the dinner table! I just recently made carbonara without cream for the first time–after seeing an episode of Anthony Bourdain where he ate carbonara in Rome. It certainly was plenty rich and creamy without the cream!